I knew Tyler was coming because of the almond trees. Everyone was on the edge of their seats as soon as Tia Lu introduced him to our 3rd grade class. No one knew what to make of him—he was thin, extremely tall and pale. His eyes were dark like roasted almonds and his hair black like the mountains at night. He looked like nothing we had ever seen. He didn’t speak any Portuguese, so everyone in our class asked him silly questions like if he was gay or a woman. He answered yes because he didn’t know what we were saying and didn’t know what else to say, and everyone laughed. But we all followed him around at recess and liked him because he was an American, so I guess it was okay. The night before he came to our school, the almond trees were shaking their leaves like dogs shaking off water, and that’s how I knew he was coming. They were shouting: He’s here! He’s here! I opened my window, which looked down at the beach where the almond trees lived, put a finger to my lips and shushed them as loudly as I could. They must’ve heard me, because they stopped their shouting, and I went back to sleep. But when I got up the next morning and left for school, they were still shivering with excitement. I gathered that one day I would be old enough to make sense of anything my grandma said, and then one day I would be too old to listen to any of it. I listened. I didn’t hear anything worth hearing, but it may have been because my senses were overcome with the smell of cigarettes that followed Vó around. She didn’t smoke anymore, but she always had a cigarette hidden somewhere on her body. “To understanding them.” I grimaced. “Don’t worry, bonequinho, you will understand all of it one day. At first it won’t all make any sense. But they hold on to your memories and talk about your dreams; and then they guide you to them—maybe to a beautiful girl who you will spend the rest of your life with.” She laughed. I first heard an almond tree speak the day of Vó’s funeral. When we came back home, my mother went to her room and my father lay on the couch reading a botany book. I walked across the dusty cobbled street where the almond trees stood, waiting for me, on the beach. The salty breeze was cool and calm that day. The big green and red leaves were barely moving, barely whispering. I figured the almond trees were sad for Vó, too. She spent so much time with them. My body felt empty, as if the breeze could lift me up to the branches, and the only thing I could think to do was talk to the almond tree closest to my house. “Where is she?” I whispered, my voice trembling. Nothing. Just the sound of the waves washing out the shore. Everything around me felt empty without Vó, and the silence was unbearable. And then a little wind blew, stronger than a breeze. The almond tree began to sway gently, waving its paddle-like leaves. She is well, it whispered. She is here. She is us. My body shook, that way it does when you see something really painful happen to someone else. The other trees joined with the coming of the wind: We’re here—she is here. She is us. I pressed my face to the trunk of the tree and wrapped my arms around it as tightly as I could. I cried so much I forgot to breathe for a while. But the more I started breathing again, the more I could smell Vó’s cigarettes, wherever she hid them now, and that helped calm me. When I came home from school the day I met Tyler, I ran across the street to the almond trees before even thinking about home. I stepped firmly on the sand and looked up to the leaves, where the little almonds were hiding. I had that feeling in my stomach, like when your father slams on the brakes so suddenly you fly into the back of your mom’s seat, so I knew what the almond tree’s answer would be. But still, I had to ask. A breeze came; the tree shrugged. It said nothing, as if to tell me this was just the way it was. I looked at it hard and long, and it just stood there not saying anything. It wanted me to just get over it, I guess. 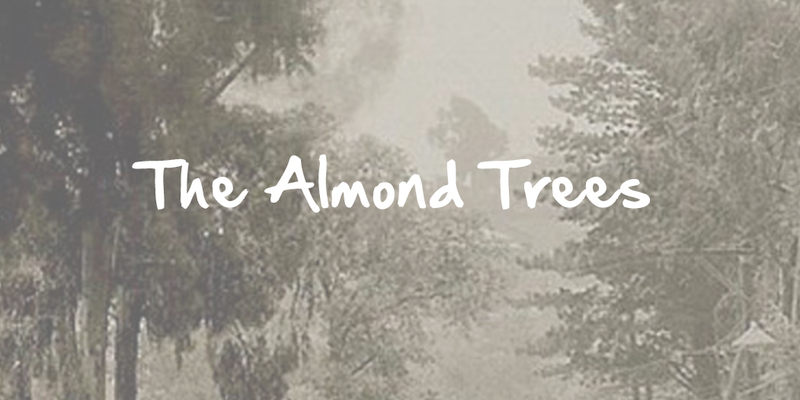 I looked around at all the other almond trees lining my street. Nothing from them, as well. I took a deep breath, exasperated with the trees, and turned around to cross back to my house. I had nothing left to say to them, and they had nothing that I wanted to hear. Before I crossed back to my house, I waited for a car passing by. From one of its windows I saw Tyler’s face, looking out onto the water as his parents drove to the end of the street, where they lived. It gave me a start, and I turned to the almond tree behind me as if it too had seen him. Now of course trees can’t smile, and I don’t want you to think I am crazy, but I could feel it smiling at me. Tyler and I became best friends. I was the only one in my class who spoke pretty decent English, which my father taught me, so I was the only real option he had at first. We would play on the beach every day before and after school. We ran about the sand pretending we were brothers, ghosts and ninjas and vampires and all kinds of things. We even pretended we had a dog once. “You know what I was thinking?” he said one day after school. He shrugged his bony shoulders. “Can I tell you something—a secret?” he said after a moment. I didn’t want to tell him what the almond trees had told me. I could hear them, every single almond tree on the beach, telling me I should do it, every time we played outside. But I was too afraid—it was too weird. I hadn’t told anyone. So I decided I would let the almond trees tell him themselves. It was all their idea anyhow. I signaled him to follow. The very tip of the sun still lingered behind the mountains as if it too wanted to see this, leaving the sky red and pink and gray. He looked up at the leaves, where I was looking. A cool wind blew in from the water. It blew through the branches of the almond tree, but the leaves didn’t move. It was as if they were frozen. I stared at the almond tree with pleading eyes. I guess the tree was afraid to tell Tyler I liked him, just like I was. My heart sank, and I glared at the leaves. I looked around at all the other trees, helpless. And he ran off to the shore. Vó did leave me with more than just the smell of cigarettes that lingered with the almond trees. When my parents were digging through all of her dusty junk a few days after the funeral, they found a letter addressed to me. My parents laughed when they handed it to me, said my grandma was crazy and that I should just open it now. But I said she wasn’t crazy, and rarely wrong, so I would wait. I knew I was going to need it if for some reason I stopped listening to the almond trees. They would have to do something really terrible for that to happen, and I was going to need something when that time came. I hid the letter in my underwear drawer, hoping I would never need it. Tyler came running to my house one Saturday morning. It wasn’t very early, but I was extremely tired. The almond trees had been very agitated the night before, whimpering all night, and they didn’t let me sleep. I was still a little angry with them, so I just ignored them. Tyler barged into my room as if he had found a giant squid stranded on the beach and he wanted me to come see it before it was gone. His usual half-moon smile was gone from his face. I sat back on my bed. I suddenly felt nervous, and I didn’t know why. My throat closed up, but at least I managed to smile. The night before Tyler left, our street had a going-away barbecue for his family out on the beach in front of our houses. The wind was cold and strong that night, but the trees were saying very little. I hadn’t talked to them since Tyler said he was leaving, so I didn’t know why they were so silent. I was too angry with them for letting him go. I thought maybe they couldn’t speak now that their leaves had turned brown, but eventually they spoke. Tell him, they kept urging me feebly, as if their voices were weak. I had already decided I would, so my stomach felt like I had swallowed three whole fish that were still cold and alive in my belly as we played outside. We were only alone when we went back to my house to make some hot chocolate while our parents drank and laughed and talked loudly outside. “Can I tell you a secret?” I said, once we were in my kitchen. “Hello?” he called out to me. I put both my hands on his face, just like they did on TV, and I pressed my lips to his. It felt weird and warm, but he pushed me away very quickly. “What was that for?” he yelled. I stood there paralyzed, my eyes fixed on his, and I still couldn’t say anything. He looked at me as if the fish had crawled up my throat and fallen out of my mouth. He ran out of the kitchen. I couldn’t move. I couldn’t go after him. Eventually I came to my senses and went upstairs to my room. I lay in bed, still unable to piece together anything that had happened. What I had done played over and over in my head as I listened to the laughter outside on the beach, and I regretted it more and more. Never had the almond trees been so silent, but still I couldn’t sleep. I was still awake when everyone had gone back to their homes. I was still awake when the sun came up, finding its way through the slats on my window. I opened the window to let it in, as if it could keep me company. I looked down at the almond trees. I guessed all their leaves had died, because they weren’t saying a thing. And then again, I didn’t want to hear it if they did. They made all of this happen—I would never forgive them, or myself for listening to them. I lost my best friend because the almond trees made me hope for something that could never happen. It’s a good thing I didn’t go talk to them before Tyler left, or who knows what they would’ve had me do. What I had done was stupid enough. I was old enough now, I thought, just like Vó warned me. I didn’t need the almond trees putting silly thoughts in my head. I walked over to my underwear drawer and dug out Vó’s envelope. I held it for a few seconds, as if it could slip away from my grip and fly out the window into the horizon. I opened it and unfolded the paper inside of it. Never stop listening, I read. I looked down at the tree branches that made up my grandma’s handwriting. The words, as if they too were covered with dead, silent leaves, left me feeling more empty and alone than before. He left the next morning after I had closed my window, and though my parents knocked on my door so I could come out and say good-by, I pretended to be asleep. And once he was gone, I did fall asleep. My parents didn’t bother me for the rest of the day, and by the time I woke up the faint moonlight found its way into my room. I was turning in bed, not wanting to get up yet, and I saw a note on the floor that had been pushed under my door. I got up slowly, confused, and walked over to it. It didn’t say who it was from, but I knew Tyler’s handwriting too well. I slowly remembered everything as if it had been a distant dream: what I did, what Tyler did, what Vó said in the letter. I thought about it more and more. I left my house and crossed the street to apologize to the almond trees. The leaves had fallen from the almond trees, leaving only a few red leaves on their branches. The brown ones were all crunching underneath my feet as I walked on the sand. I looked up at the naked branches above my head, waiting for a breeze. They had nothing left to say for now; they couldn’t if they tried. It was all dead, everything they had said. I couldn’t even smell Vó’s cigarettes anymore, and I couldn’t help feel I did this to them. But Vó’s words were still here, alive, as if the little waves carried them on their moonlit tips as I looked out at the horizon, at the dark water, the burnt mountains and the moon. I sat down on the sand and covered my legs with the dead leaves so they could keep me warm. I leaned over and rested my head against the trunk of the almond tree, and placed my hand on one of its roots, caressing it with my thumb. I fell back asleep, waiting for spring. 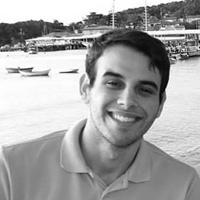 Bruno Barbosa grew up in São Pedro d’Aldeia, Brazil, and moved to the U.S. when he was 10 years old. He survived the move and the many moves that followed, and now is a student at The University of Texas at Austin, where he is working towards a BA in English and a BM in Vocal Performance.